Last week I asked you to help me decided what sweater to knit next, and the Tea Leaves Cardigan won with 40% of the vote. As you can see, I’ve been hard at work on it! The yoke is done, and I’ve knit 5.5″ on the body in about a week – not too shabby if I do say so myself! 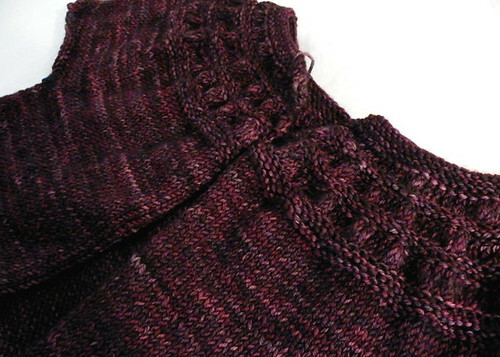 The yarn – MadelineTosh DK (formerly worsted) in Oxblood – is a dream to work with. I’ve used this yarn before, and there’s a reason it’s become one of my go-to sweater yarns. It’s so soft and the colors are incredibly rich. My goal is to have this cardigan finished before the start of the Winter Olympics. That’s two weeks from today. Think I can do it? Absolutely you will! It’s gorgeous and that colorway is great! Carry on. Why is it DK formerly worsted? Did they change the specs? Or did you trade the yarn? MadTosh worsted has always been more of a DK/light worsted weight, and as of this month they’ve changed the name of it to MadTosh DK. At the same time, they’re starting to release to stores MadTosh Vintage, which is their new worsted weight. I haven’t had a chance to knit with Vintage yet (I’ve got a couple skeins on order that should arrive tomorrow), but I have molested a friend’s skein of it, and it’s super. I don’t think it’s the same base, spun heavier. It feel a little different (maybe *slightly* more wooly, if that makes any sense), but the colors retain the knockout vibrancy of the old worsted now DK. Wow, I like the cardigan, especially the colour. Do you prefer to knit from the top? I have never done it, but it looks easy. 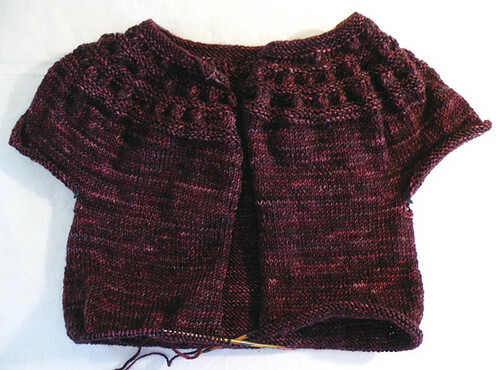 Oooh, looks a lot like my Tea Leaves Cardigan! I knitted mine in Sundara Sport Merino Poppy colourway. Almost done but ran out of yarn 4 garters rows into the second sleeve. Sundara is dyeing up a batch of yarn for me so I can finish it. Your cardi is looking awesome! Love the color! This sweater is for sure in my queue.